Male Atoll Maldive Islands, Indian Ocean. 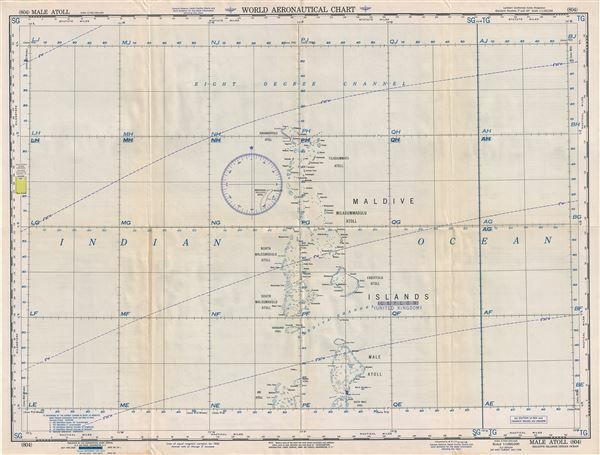 This is a fine 1958 U.S. Air Force aeronautical chart or map of the Male Atoll and vicinity of the Maldives located in the Indian Ocean. Focusing on Male Atoll, the map covers the Ihavandiffulu Atoll, the Tiladummati Atoll, the Miladummadulu Atoll, the North Malosmadulu and the South Malosmadulu Atoll, the Horsburgh Atoll, the Ari Atoll and part of the South Male Atoll. The Island of Male, where the capital of the Maldives is located is identified. The map is highly detailed and notes hydrographical and topographical features essential for the air pilot. Verso of this chart features legends and a world aeronautical chart index. This chart was published by the USAF Aeronautical Chart and Information Service, and was issued as chart no. 804. First issued in 1946, this is the second edition revised to May 1958.